"Although I was born and raised in Wisconsin and now live in Central Illinois, I have had a lifelong interest in the Copper Country. This is because the maternal side of my family has deep roots in the area. They were among the first settlers during the 1840's, centered mainly in the German community at Eagle River. One of the patriarchs was Joseph Long, the first Sheriff of Keweenaw. Another was John George Louis Haun who was one of the Germans so often mentioned but never named at the Cliff mine. He met and married Mary, the daughter of Anton Gipp, in Eagle River during the Civil War. My great-grandfather, Anton Friedrich Haun (listed as Antony F. in the C&H 50th Anniversary Program) was born in the small village on top of the Cliff. He started working underground when he was 12. They left the Cliff for Calumet when C&H opened the Calumet Conglomerate, and he worked for C&H until 1920. He was in charge of one of the shifts that drove the 81st haulage way between #12 South. Hecla and the Red Jacket shaft. My youth was filled with stories of the Copper Country and every summer brought a two-week trip "up home". It was during this time that I heard even more from the multitude of relatives and friends that still lived up there. When I was about 8 or 9, I must have been a big enough pest to get my wish to visit a mine. After that, it became an annual event until they finally stopped allowing visitors. For me the die was cast, I have been an avid Copper Country history buff since grade school. I am also a model railroader, and of course model the Copper Country railroads and mines. I also return to Eagle River every chance I get." 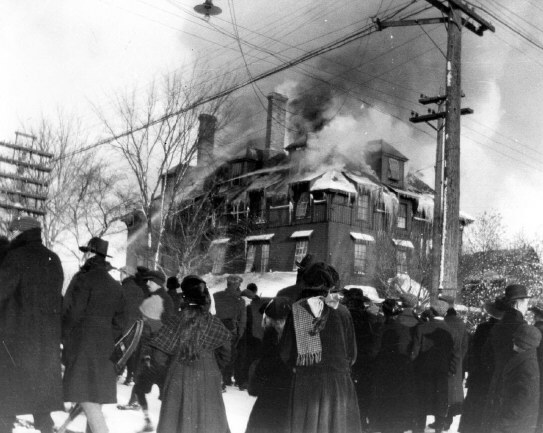 Below is a picture of the Calumet Hotel as it was burning. Taken in the early 20s. Below are some views of Ahmeek #2. 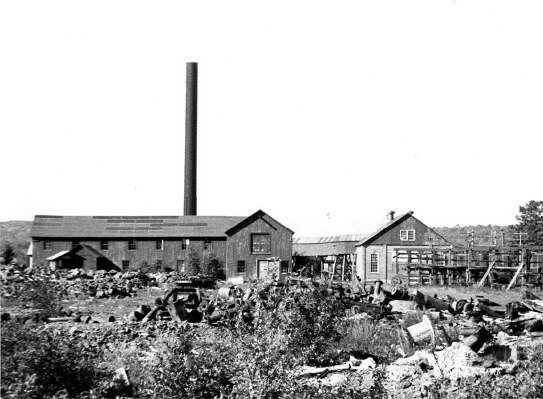 This shaft was claimed to be the most productive single shaft in the Copper Country. Located on the richest part of the Kearsarge Amygdaloid Lode, it had two hoisting compartments and a ladder and pipe compartment which was standard for shafts operating after 1900. 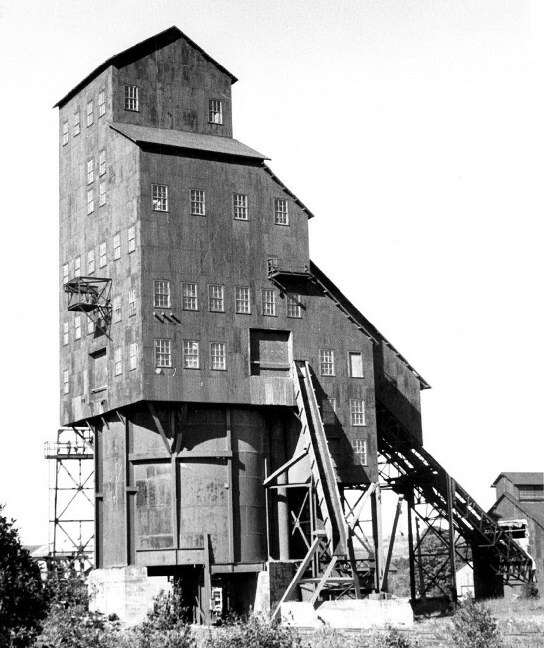 Number 2 was the sister shaft to Ahmeek #1 which was 1440 feet Southwest along the strike of the lode. Both began sinking when mining commenced in 1903. They were located along the property line and the surface plant was designed the old way with a central hoisting plant and rock house. 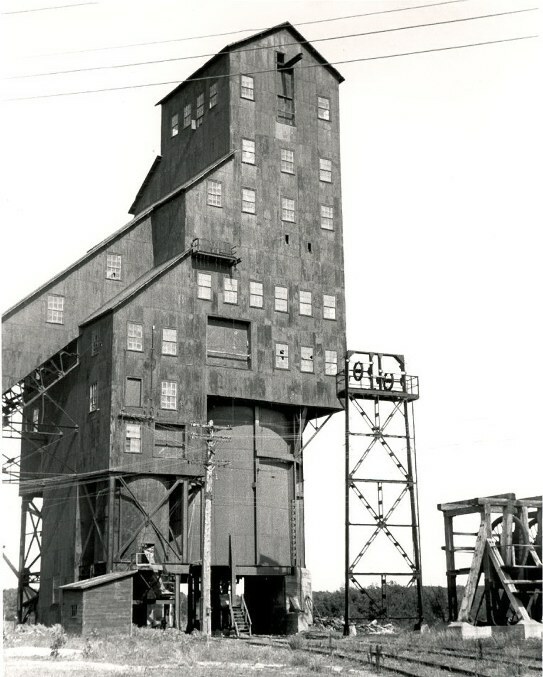 There were two separate hoist houses back-to-back and the hoisting cables were carried along the ground on low pulley stands. 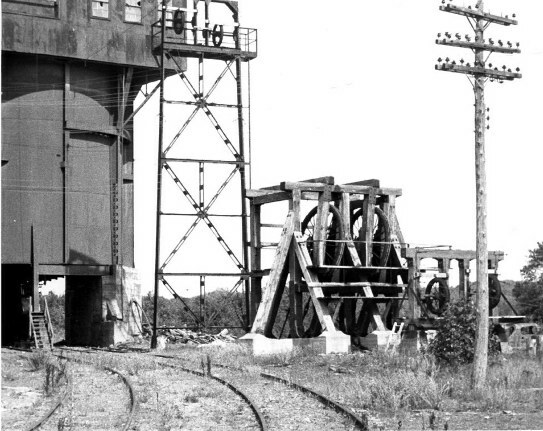 Once the cables reached the shaft houses, they were abruptly turned up to the head sheaves by a set of big sheaves mounted in a heavy concrete and timber frame. As one can see in the photos of #2, the hoisting cable had to make a compound turn around the head sheaves to extend down the shaft. The shafts were equipped with the standard Nordberg 2 cylinder hoists with 5000-ft capacity. The skips were hoisted in balance; one was coming up as the other went down. The hoists were housed in rather modest brick hoist houses. Ahmeek #1 was located in fractured ground and was abandoned around 1915. The shaft house pictured was built in 1915 with primary sizing and crushing equipment and the old central rock house was abandoned. Number 2 then was the sole shaft for that area, mining both the area it was intended to and the area below the fractured zone in the former Number 1 area. After the 1923 Consolidation it also served the old Allouez territory. Ahmeek #2 lived and produced in the shadow of the more famous Ahmeek # 3&4 that was right on the highway, while #2 was a bit off the beaten path. 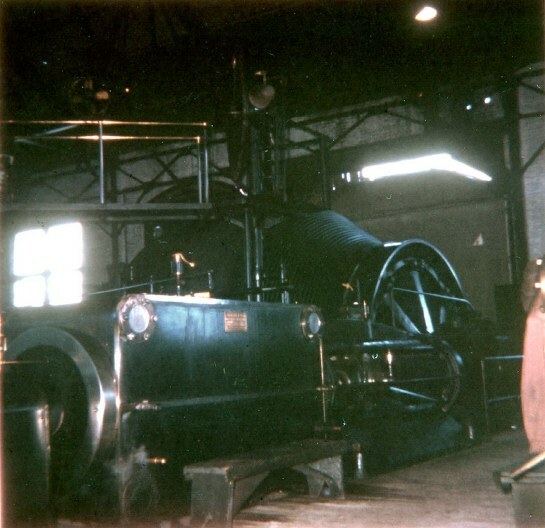 #3&4 had a showpiece hoisting plant and a massive double sized shaft house whereas #2 had a very utilitarian plant. The skip at #2, however, was called "the Money Maker" since every trip made a profit. The shaft was a producer for a little over 60 years. We often visited 3&4 during the `50's and early `60's. I regret we didn't visit #2 when we had the chance. Below is a shot of the Ahmeek #4 hoist. 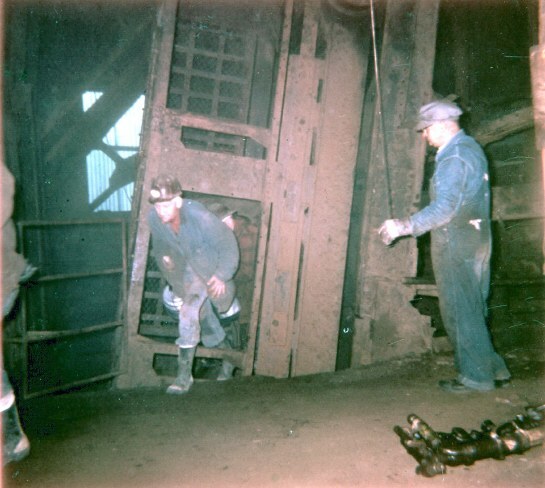 This was a "stock" Nordberg 5000 foot hoist like many of the shafts up there were equipped with. These prints were given to me by a friend over 40 years ago and were taken with a Kodak Brownie, hence the reduced quality. Below is a picture of the day shift coming up out of Ahmeek #4 sometime between 1955-60. It was amazing how the Hoist Engineer and the Lander could spot each compartment of the man car with the Engineer hundreds of feet away and out of sight. It was all done with bell signals. It was best to visit at shift change with all the action at the shaft collar.